Here’s the studio that I designed and built for Radio Sausalito. It is based around a Broadcast Electronics board that used to run KDIA 1310 AM in Oakland. 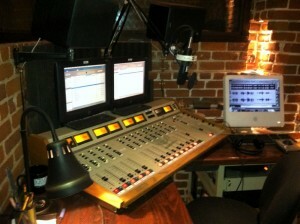 The board was donated by Disney/ABC to Radio Sausalito. The two screens are touchpanels using ELO technology.